Thank you, Harriet, for hosting the meme. Go visit "Hey Harriet" and other participants here. A very pleasant photo and shadow. I love your seasonal header, too. I like this one ... good choice for the shadow theme. Getting into the holiday spirit I see. nice! Is that an old railroad cart? They used to unload out of the cars onto them, I think. Cool shot! What a cool old wagon! Old wagons are not something I ever stumble upon, so I get a kick out of seeing photos of them. I'm not sure if I've said this before, but I love your little profile pic! Those big goofy green glasses always make me giggle! Hi Mary - love the way you've decorated for the holidays! Hope your Thanksgiving was swell. Take good care of NY for me, I'll be home for Christmas! That plain shadow shape makes quite a proud statement about the old red wagon. It looks like a platform to show off its rustic beauty! Lovely shot! A very peaceful shadow shot, thanks for sharing. 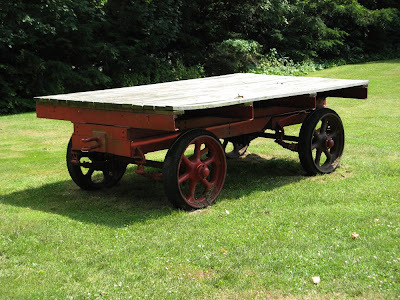 I love red wagons and just about anything old and made of wood. and the sunlight and the grass make it even lovlier. Lovely shadow shot, it is calm and and an warm picture. What a delightful picture of wagon and it's shadow! What a fun post! Very well done. I truly enjoy your photographs. I love the dark strength of the shadow and how it complements the lovely old wagon. Great shot! That is a very cool shadow shot. Love the colors as well as the shadow.